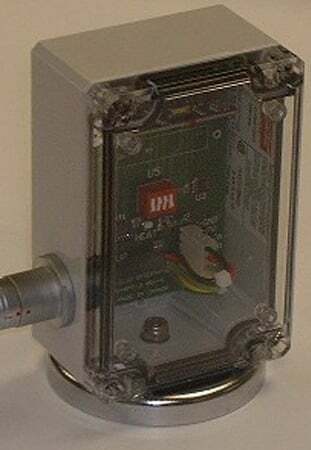 This very small Antenna Unit picks up radio signals from the operator's hand-held remote control, decodes them and sends the information to the larger Receiver Unit via a cable (as shown below). A powerful magnet at the bottom of the Antenna Unit allows it to be easily attached (upside down) to the centre of the main lower girder of the crane. In this position it will receive excellent radio signals from the operator's control unit. The connecting cable can be long enough to put the larger Receiver Unit anywhere on the crane that is convenient.